Think of it. A life completely devoted to the cause of Christ. Not a divided life, where half is devoted to Christ and half is devoted to self…but completely and utterly surrendered to the cause of Christ. For some, dare I say most, being Christ’s broken bread sounds great on paper. It even sounds romantic to some degree, but truly living a broken life before God and man is an extremely daunting task indeed. Our borrowed time, our pooled financial resources, our hobbies and precious treasures…they mean nothing if they are not subjected to the filter of Christ on the cross. Everything will eventually pass away. Everything will eventually disappear from us. But one thing will remain: God’s love for us, His people. In return, our duty, our purpose for living ought to transform our thoughts, our passions, our perceptions of the stuff we own…all of it in the spectrum of grace and redemption. 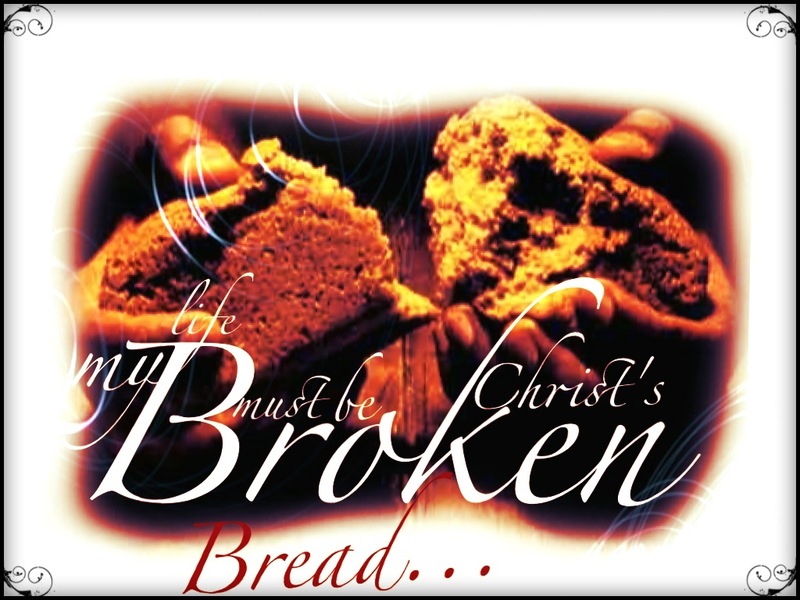 Why do we need to become Christ’s broken bread? Because there are countless souls in our world who need salvation! There are many lives who are still lost in the darkness of sin and certain death! Without willing servants of Christ giving their all in His services, they will perish! Some might utter the excuses like “the Holy Spirit can save them”, and rightly so but Christ has sent US to be His ambassadors into this world. The Holy Spirit is with us in this venture! Without the willing hands and feet of Christ, who have been broken and humbles before His love and grace, the great commission cannot be fulfilled. We are called people. Set apart for His holy purpose in this world wrought with sin! People in our own neighborhoods are lost and in need of anyone who is willing to love them and show them this amazing Christ whom we serve! There are countless souls caught up in addictions of all kinds who are in need of the extension of grace that Christ has given to us. Who will be Christ’s broken bread to them? Will you? Will I? This isn’t some part-time calling. It’s full-time within our occupations and our passions! We are called to be His broken bread to the world, and that starts with our family’s, neighbors, friends and even enemies. It will not be easy! There will be days in which we will utterly fail along the way. Other days when we will be scorned and mocked. Yet this humbled state of servants of Christ brings upon our lives such a richness of mercy, grace and love! Next Post Dreaming too small…finding our Goldilocks goals. This song has been yellowed out in my own SASB since I was a young girl!!! Next to it is the chorus 53 from the CS/SASB with John 6: 35!!! These songs flood my heart!! !